Grills obviously produce a lot of intense heat. 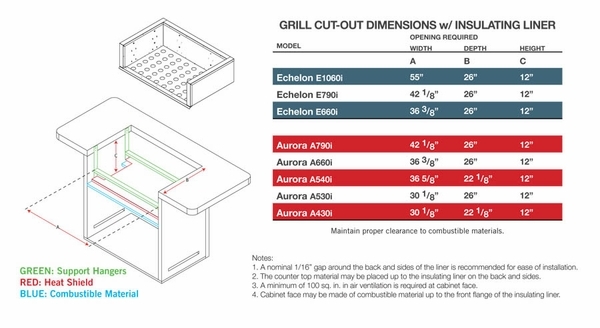 If your outdoor grill is going to be installed in a structure containing wood or other combustible/flammable materials, an insulating liner between the grill and the structure is necessary to prevent accidental fires. This liner fits E790 and A790 grills by Fire Magic. Installation of the liner is simple. The installation requires a brick opening of 42-1/8" W x 26" deep (front to back) x 12-1/2" high.